As some of you know, I absolutely love autumn. This is the time of year when I get out some of my fall wardrobe, including my favorite leather jacket. To me, nothing is better than a comfy pair of jeans, hiking boots, a cute shirt, and my leather jacket. Comfort is my number one priority as I explore nature and get involved with more outdoor activities. My problem, however, is that I usually like a large purse. While some large purses are fine, I prefer something closer to the size of a messenger bag or backpack since it gives me the room I need to carry books, and whatever else I need for the day. Unfortunately, most messenger bags are far from fashionable, making them a not so great fit if you want to also look nice as you go out. 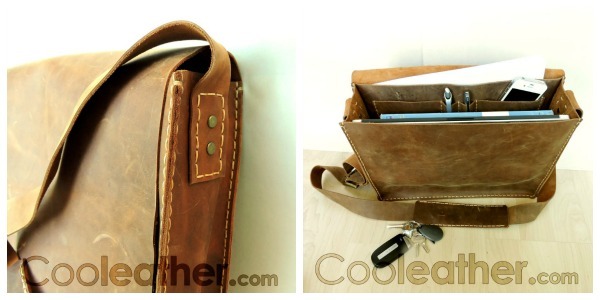 Recently, however, I found the perfect solution – a leather messenger from Cooleather.com! Looking for an awesome place to buy unique, genuine leather bags? If so, we think you will love Cooleather.com. 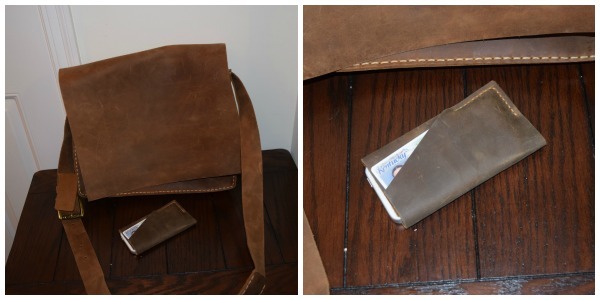 They are a group of Canadian artisans devoted to creating handmade, genuine leather products. Their designs and handcrafted leather products are unlike anything you will find anywhere else. Unlike the bags you will find from large manufacturers, these bags are not made in factories, but actual people who are devoted to creating the best leather products out there. As well, each of the bags are tanned using vegetable oil and gentler chemicals to better protect the leather, keeping it strong and durable. Of course, you also get the benefit of knowing your bag is truly unique, since it was handmade. In other words, no other person will have a bag that looks exactly like yours, something most manufacturers can’t claim! Once you have tried some of the amazing leather products they make for men and women, you won’t want to shop anywhere else! 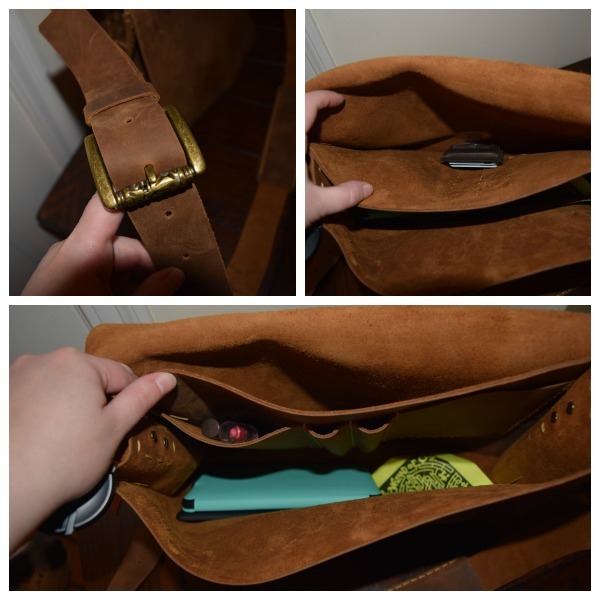 Hand Stitched Leather Messenger Bag: What is It? 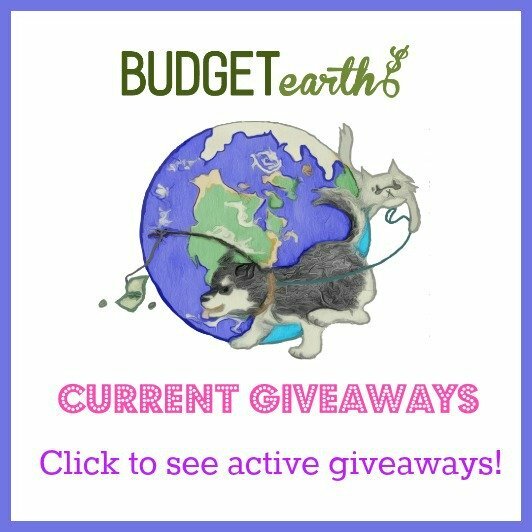 Want a unique shoulder bag or cross-body bag that is perfect for carrying all of your daily items? 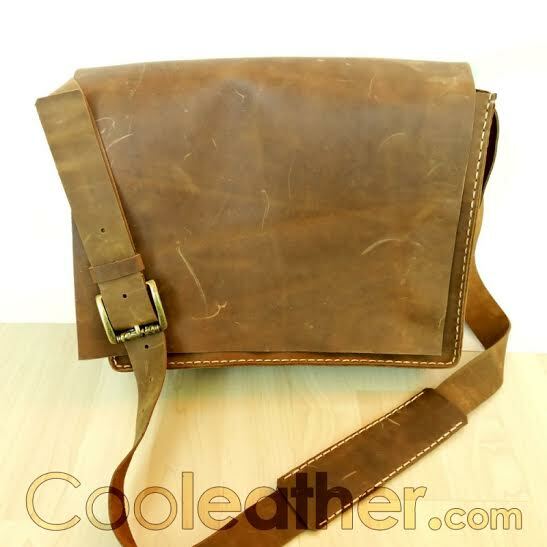 If so, we think you will love Cooleather.com’s Hand Stitched Leather Messenger Bag. This genuine leather bag is made from brown crazy horse genuine leather and has waxed thread, giving it a beautiful semi worn look that comes with truly handmade leather items. Not only is beautiful on the outside, but inside as well, featuring a big inside pocket and two smaller pockets for your cell phone, and two pens. Behind that divider, you also have a nice pocket for putting things such as books and other large items. As well, it has a beautiful decorative shoulder buckle, making the area to adjust your strap as fashionable as possible. One thing is for certain, this bag is will definitely get you some compliments this fall! Right after my bag arrived in the mail, I was invited to go out with family to a corn maze and little fall festival in Lexington, KY. Since it was the first day I could really go out with my leather jacket, I packed up my Hand Stitched Leather Messenger Bag and new wallet. Since we were bringing Reya with us, I packed my bag with not only my normal purse necessities, but our Kindle Paperwhites and dog treats. From the moment I got out of the car, I was immediately getting compliments on this bag. Everyone wanted to know where I got it there and on the way back home. In my opinion it made the best sort of fashion statement – stylish and practical! Of course, a good bag is more than fashion. Inside, it has two main pockets and smaller pockets in the divider for pens, your wallet, and other small little things us ladies like to put in our bags. And of course, I can’t forget the wonderful smell and softness of the leather itself. You can always tell genuine, high quality leather by the feel. This leather is super soft and has that slightly worn look that I adore. To me, a good leather piece is something that has been manipulated by a person or wear, not just a factory assembly line. Really, I don’t think I could be happier with my Hand Stitched Leather Messenger Bag and can’t wait to do some more shopping at Cooleather.com after using this bag. Based on my own experience, I am delighted to give this messenger bag an A+ rating! Would you like to purchase this beautiful bag for yourself or someone in your family? You can find the Hand Stitched Leather Messenger Bag on Cooleather.com for only $159. They also have a 100% satisfaction guarantee, making sure that you are happy with your order every time. If you are like me, however, don’t be surprised if you buy more than you planned! To go along with my review, I also purchased a chic leather iPhone case and wallet, which is not only durable, but matches my messenger bag. With how much I love my bag, I have a feeling a new leather backpack purse is also in my future! Don’t forget to connect with Cooleather.com on Facebook and Twitter to get the latest sales and restock information. Also as a little hint, don’t forget to check out our Cooleather.com giveaway for your chance to win this beautiful bag! That is an amazing price for something such high quality! I’m heading over now to take a look. I like this bag because it is sturdy, well crafted and looks like it would only get better with age and use. I think this is the one bag my husband would be proud to carry especially when we travel! Thank you for the post & the link to the cool leather site! This is a lovely bag, I like putting the strap across my body and messenger bags are very roomy. I love this bag as it is unique and stylish. I love the compartments it has and I have always been a big fan of leather. I love this bag! I particularly like the “distressed” look and the fact that each one is an individual since they’re hand made. Such a bag had my brother about 30 years ago. I adore the smell of. I love the styling of this bag. It would look nice with everything! I’ve never shopped at Cooleather.com before. I absolutely LOVE this bag. The messenger style cross body has always been my favorite. I love that it’s handstitched. Their guarantee tells you how much they believe in their products. I love this! I would rock it everyday! I love the durability of leather! It ages beautifully and any scarring or discoloration makes each bag unique with its own look. I also love messenger bags. I like the easy accessibility compared to backpacks and the space compared to most purses. I like how the leather gets worn. It truly makes it your own! Wow, that is a beautiful bag. It would go perfect with my boots! I love the simple design of this bag. Plus, I love the smell of leather 🙂 This would be great for many uses. I have seen this bag and was curious about it so nice review! I love it! I love this bag! I love the organized pockets and, well everything! I love this leather bag. It just the right size to carry everything you need. I really could use a new one and this looks great. Even in the photo this bag looks incredibly soft. I would carry it, even though it isn’t a style that I normally would look for. I love this messenger bag! It is so pretty. I looked at some of the other items that they make, and I am amazed by the craftsmanship. I have worked with leather and it is quite difficult. I cannot imagine how difficult it would be to hand stitch leather. Hope I win this! I will be able to use it for the rest of my life! Hand made and all leather just makes it practical and useful. I love the look of this bag! It reminds me of 60s Boho-style, a little. I love the slightly worn look of the leather. What a Beautiful messenger bag. The craftsman shift that I can see from these pictures is just amazing thank you for bring these artist into the spot light! I love this bag because it already has a lived in, comfortable look! It also looks like it has that yummy leather smell! Awesome! I love the style and the rugged look I also love that there is a lot of compartments to I can be organized and that this is unique. SO COOL!!! These are really nice. Thank you for your review. What a great bag!!! I love, Love, LOVE it!!! Thank you for your fantastic review! What a sharp looking bag. Not flashy. Love the distressed look. I love messenger bags too. They are the perfect “medium size” bag, not too large, not too small. Like you say you need room to carry books or tablets, but also space to carry smaller things where you know that they will be without having to search all over! And last but not least, leather! You know this bag will be sturdy and last a long time 🙂 Thank you for the review! I so love the look of this bag. I like the wide strap those are always easier on my shoulder. I would love to carry all of my stuff in this around town. I usually carry a large purse as well, but I think this bag is good for a more casual look. This would make a great bag for school. Thank you for sharing this review. I love this bag it has the perfect worn look. Wow, i really like the look of this bag!! It looks so soft, yet sturdy!! Thanks for the review..I’m going to check out the wallets also! I love this bag. I like accessories that have a natural look and feel and this definitely fits that perfectly. Very nice. I love the look of this bag. I could easily use it to stash a couple of diapers & a pack of wipes & use it as a diaper bag, but then turn around the next day and carry my necessary non-mom supplies. My husband would even use it & not feel all momish about carrying a diaper bag! This bag looks like it could carry a lot! I love the quality and the handstitching as well. I love the look of this bag. It would go perfect with a jacket, blue jeans, and boots. I like how sturdy and well made it looks, yet soft and feminine. I would love to throw this bag over my shoulder. I love how soft the interior looks. I love the rich brown color of the leather and the construction is both stylish and utilitarian. The easy casual style has a slight bohemian vibe that is casual and chic.. Simply gorgeous! Hello, Oh I love the rustic look of this bag and I love it because I think it would also be great as a laptop bag for a man. I could give this to my son. Thanks for a great review. I love the look of this bag. It looks soft too. Just the right size. Bssed upon your review I would love to have one. I have a black nylon messenger bag that someone gave me many years ago. Needless to say, it is old and I could use an upgrade. This leather messenger bag seems to be the right one for me. This is a timelessly attractive bag that should last a lifetime and beyond. I love that it’s brand new but looks like an heirloom, and I’d be proud yet comfortable carrying it. I love that it is made of genuine crazy horse leather. I also love all the compartments. looks like a beautiful and well made bag! I love this bag because the color is really versatile and it is also nice and roomy so I could carry a lot in it. I think it seems to be rally durable as well. This hand bag looks buttery soft. I like that it’s hand stitched. They really put a lot of work into making these. I’m not much of a hand bag carrier, but, I would carry this. I also love the feel and smell of super soft leather. So great that it has the inside smaller pockets. Pretty and useful. Wow this handbag is amazing! The detail and size is perfect! I love that it isn’t too huge, but has enough room for everything!! Thank you for the review! I love a bag that is large enough to hold all my daily necessities as well as those times I need my ipod and my kindle. I love the look of the leather and that it has a long shoulder strap. Even the price is good. A very nice bag! I love how this bag looks worn in and used. It has character, yet seem sturdy and have great storage space! I like this leather bag because it look really well made. Thanks for the entries to win. I like that it is crafted out of real leather, handstitched, and very fashionable. I also like that it is big enough to carry what I need for the day. I love that this suitable for any outfit, it has a bit of edge to it too, which I look for with anything I’m going to use daily. And, the crossbody style is practical too– who doesn’t want to be hands free?! This bag is very beautifully stunning,would go with alot of my fall wardrobe,of high quality,beautiful stitching. Love it! I love that it’s hand sewn, it would last longer that the fast machine thing that have string hand off them and then they pull out and fall apart. This is a gorgeous bag, I could see carrying it as an every day bag. I really love the look of messenger bags. Love this bag. I love the distressed look & the color. I love the look and feel of leather and it’s a great size. I love leather. Every mark on it only intensifies it’s own personality. This bag would probably last me the rest of my life. I LOVE this bag! First, it is the color of my Favorite BOOTS! And since I grew up on a farm, I love that this looks like rich saddle leather and it is oil rubbed and finished with natural products, the way real leather should be finished. I also LOVE that it is Unique, like me, one of a kind, but NOT PERFECT!! With all the storage pockets inside, it would work for my job in working with Kindergarten children. I gotta keep Surprises tucked away to Reward these little treasures for making Good Choices!! I would LOVE to have this bag! So pretty, looks like it smells good, too! I like handmade products that are just amazing like this messenger bag. I would love to have this as a laptop bag. This would be a great bag for my 15 year old grandson for school. I used to use one just like it when I sold jewelry. I love this bag would be awesome to keep all of my paperwork in. This is a cool color would love to have this. I love this bag. I really like the distressed look of it and the adjustable strap. The color is gorgeous. I love leather and the smell of it. I also like that it lasts forever.I’m on a budjet so it makes perfect sense to buy something that will not break or tear and instead it gets better with age. i love that it is hand stitched and leather!!! I need a brown bag!!! would love love love to have one!!!! I love all the pockets and dividers. But mostly, it is just the leather. The way it looks, smells, feels. This handbag is so nice and fashionable. It’s a perfect bag for the fall. I would love to own one of these. This will have to go on my Christmas wish list. I love leather, especially in the browns and I love purses, especially cross body style,a great combination. I am thinking that it is new purse time! I love real leather. I like the way it feels, the way it smells, and of course, if it’s treated right, it will last for years. I also love the “messenger” style bags for several reasons, the main one is in the last few years have progressed to needing a cane. This leaves only one hand free. With a messenger type of bag, you don’t have to worry about dropping your bag. I like that the bag is a good size. It is a hand sewn bag that seems well made. I love this bag! My favorite features are the adjustable strap, all the separate compartments for the important items. Gorgeous! This looks like a stylish, high-quality bag. I might look into getting one for my brother-in-law; it seems like something he would use. I love the fact that this bag can go with literally any outfit I can think of! I adore the distressed look and the fact that it actually looks authentic. I love the color of the leather, which matches several pairs of shoes and boots I have. I also like the pockets for pens, which are lost forever in my big purse. I love the quality of the material of this bag. The styling is beautiful and the pockets inside are perfect to keep me organized. I love this beautiful bag. It looks so classic in that color and the leather looks great distressed. This would be an excellent school bag. I like that this is genuine leather and will hold all my stuff!! The inside pockets will keep me organized. I like all the pockets on the messenger bag. Like that the bag looks worn. Great size! Great review. I love the bag and want it. I love a big leather bag and this one certainly looks unique. I love the pockets and roominess and that there are smaller pockets to put pens and such. Beautiful bag. I love leather! This is a really nice bag! Would love to see other styles! I love the look and the practicality of the bag. High quality certainly doesn’t hurt either – all in all a great bag. This messenger bag is one that I would love to wear. It looks roomy as well as comfortable too. The stitch is just gorgeous. I love this messenger bag because it is well stitched. Very high quality, and most importantly very good looking. Thanks for reviewing and turning us on to the Hand Stitched bag. I have always loved leather and I love the look of messenger bags and the long straps. I love how the bag already looks worn in, but in a good way. I also like all the interior pockets! I have been looking for a new bag and this one would fit the bill for me very nicely. I love that it is handmade, it has a lot of room in it for what I need a bag for and can be used for everyday wear or dress wear. I love the nice shoulder strap it has also. This bag looks great. I really like how stylish it is and how durable and unique it is. I love that all their products are handmade and not made in a factory. I think it’s perfect for going between classes to carry my books and important things. It’s so stylish and well organized inside too! I like the natural-worn look of the leather, how it’s not a super professional shiny bag. This way it’s almost like a casual briefcase. I would absolutely love to have one of these! This bag looks incredible! I love that it is handmade in Canada. It`s obvious that a lot of care went into it. I love the clean looks of this bag. It looks like it would hold a lot, and that’s important to me when I get a new bag. I like the simple design. It is attractive and practical. What an awesome piece! The simple lines speak to me. As one who never understood my peers and their handbag obsessions, I always carried a backpack. In my late 50s I care less what others think and more about what works for me. This would work for me, while upgrade my fashion statement. This carrier bag is rustic classic and well made I hope one day to own such a beautiful bag. I be proud to have this bag on my shoulder and yes I look good! If I don’t win this I hope to know where I could purchase this and wallet would help me with work and keeping organized for sure. Thank you for having this for us all try THANK YOU ALL! This bag is so stylish yet rustic. I love the blending of these styles. The bag is made with such precision quality and it is very appealing. This bag rocks! Not only is it tough, long-wearing leather, it’s roomy, hand-stitched and has enough pockets and nooks to keep pens, cellphones, etc. handy and easy to locate. All in all, it’s just what I NEED! I like the leather idea as fabric purses wear out so soon. The compartments look great for organizing all the stuff I drag around. I always admire and like to support artisans who make handmade products. This messenger bag would make a unique and treasured gift. My oldest is heading to college this fall and I think he’d love this! I love that the messenger bag is hand stitched, super roomy and has a style that never goes out of style. This is definitely a must have accessory for anyone. I adore the simplistic design combined with roominess. You can’t go wrong with leather ’cause it can be carried whether you’re wearing jeans or a suit. Love it! I like the quality of this bag. It looks like a great gift for a Grad student graduation. I love this because it would go with everything. Leather is always great too!